July | 2014 | WE BIKE, etc. 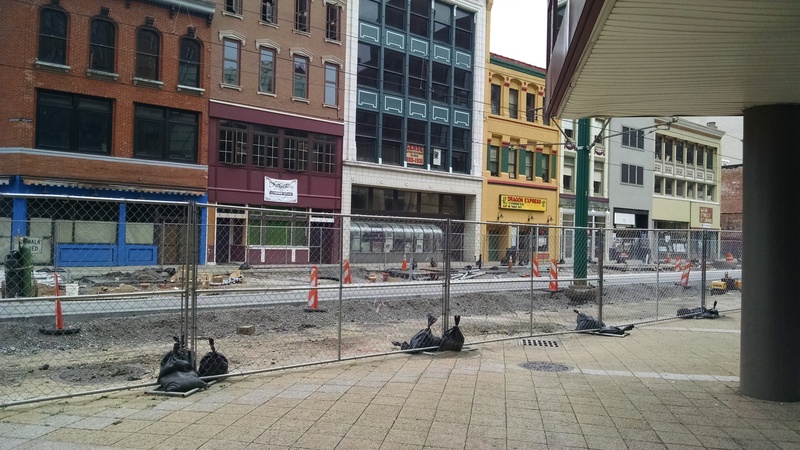 We were staying at the Hyatt in Buffalo – they had a great deal going on due to all the construction outside their doors for the light rail upgrade. We planned to stay a second day and check out the city more but the NYC Bar Exam was being held Monday and Tuesday and we could not get a room in the city on Monday night due to all the hopeful attorneys being in town. 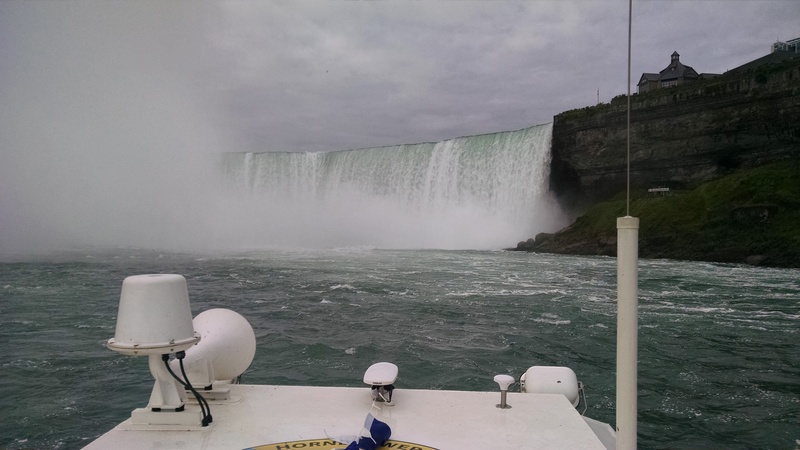 So off we headed about noon – after the storm went by- to get to Niagara Falls/Ontario Canada. Our first task was to figure out how to get across the bridge into Canada – Fort Erie. Neither the Americans or Canadians plan very well for bicyclists to cross into their countries. Once we found where we needed to be we discovered their was no bicycle accommodations on the bridge and we needed to use the sidewalk which was not wide enough for us to ride our bicycle. So we began walking our bicycle over the 1 mile long bridge in the pouring rain with wind gusts blowing hitting us from the side. To say the least it was an eventful walk across the Buffalo/Peace Bridge. The people in their vehicle were looking at us like we were nuts- oh well. We just had to laugh about it because it truly was quite funny. Once we got across the bridge we were directed to the first open lane to clear customs – so off we went to the first open lane – actually a Fast Pass Lane and the guy told us to go to the next one. Once through customs we were able to enter Canada and tried to following our Adventure Cycling directions. Just as we were getting ready to go a gentleman came up to us from a customs building and said you really do not want to go that way. He then directed us to a sidewalk that would lead us to a residential neighborhood and to the Niagara Parkway. The rain was starting to come down harder and we were hungry so we stopped for late lunch in Fort Erie and then continue on our ride to Niagara Falls. The route was very nice – Niagara Parkway was nice to ride and the adjacent pathway was also a nice facility. Although we rode most of the way on the parkway because the road conditions were better and we were closer to the river. But as we got closer to the falls we changed over to the pathway – which moved adjacent to the river. As we got closer to Niagara Falls the weather kept getting better – we were pretty much dry by the time we got in for the night. It was a great ride and really cool to come into the falls from upstream and then all of a sudden come around a bend and see this huge waterfall. By this time there were many more people around and we could not ride our bicycle and ended up pushing it along for several miles. Which was ok because the views were spectacular and we wanted to take them all in. 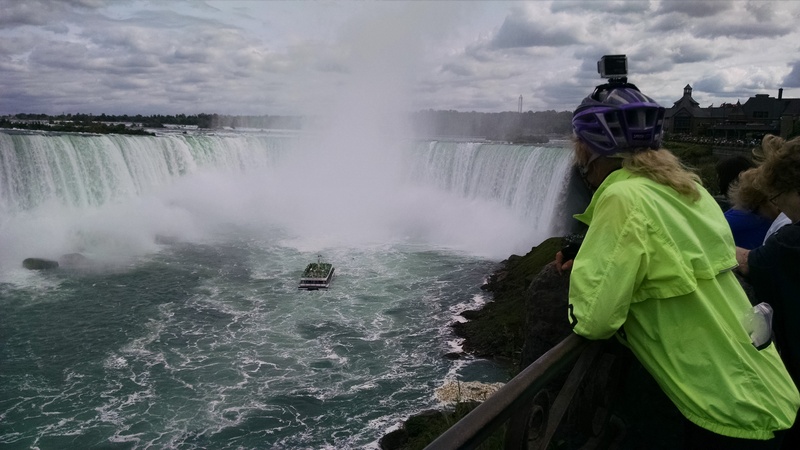 We got to see the Horseshoe Falls in Canada and also the American Falls in the United States. That evening we also went back to the falls to see them with the colored lights – Tracy was not as impressed as she thought she would be, but it still was cool. We decide to take the Horn Blower Niagara Boat Tour to the falls before we left – so we got up early and headed out for the 8:00am trip. 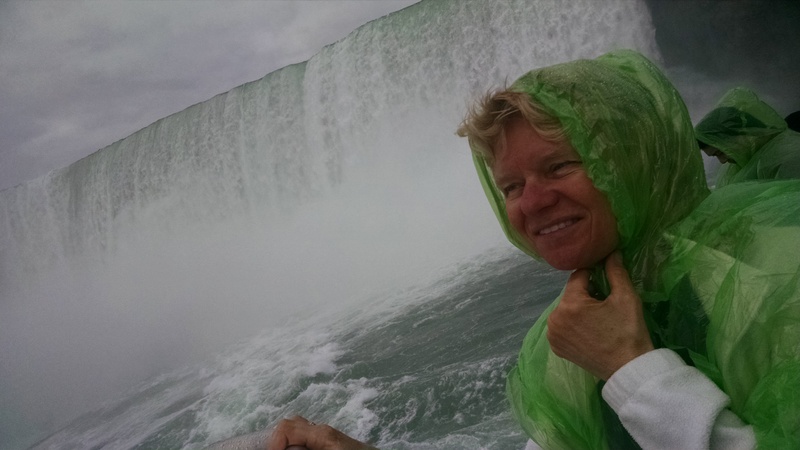 It was very fun and amazing to be that close to the falls – we really got wet with the spray from the falls. They even give everyone a rain coat for the trip – much needed. After our boat trip we headed up for our crossing back into the US – the bridge we crossed this time was the Lewiston/Queenston Bridge. The directions from Adventure Cycling were again a problem – we were told to go to the Toll Captain’s office and then cross the border. At the Toll Captain’s office a woman told Tracy she needed to go to customs – so off we went – but when we got there customs the officer said you do not have to come here just go in line and cross the bridge. Peter was not happy with the again confusing directions – although we did finally figure out what to do. We got in the car line which took us an hour to cross the bridge – we walked our bicycle across the bridge – it totally amazes us they have no accommodations for walkers or bicyclists – not even a sidewalk. Oh well maybe someday they will get it right. 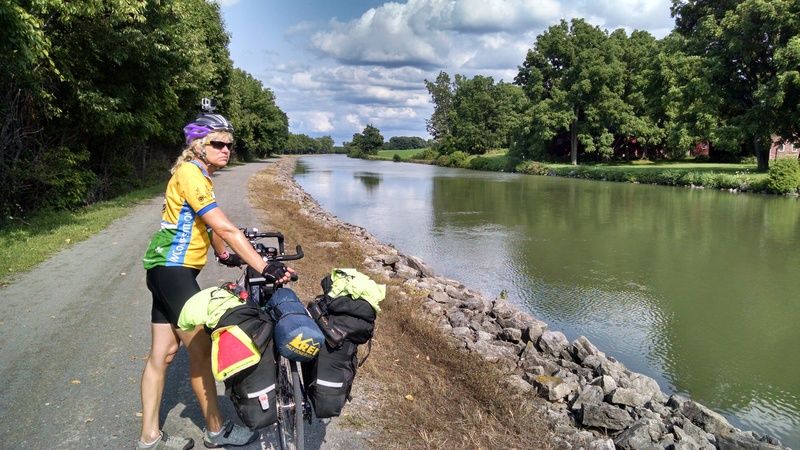 The rest of our day was pretty uneventful and we spent the last half of our trip on the Erie Canal Trail – which as you probably guessed is the old tow trail adjacent to the Erie Canal. It is pretty cool and the historical markers tell the story about the canal, bridges over the canal and buildings adjacent to the canal. The only bad part is the trail is crushed rock and in some spots in bad condition – Peter is not a fan of trails so that also makes it hard. The entire trail is 350 miles and we will be traveling on about 100 miles of it – I am sure we will see some cool sites along the way. We spent tonight at our first bed and breakfast – The Historic Village Bed and Breakfast in Medina, NY – very nice and great hosts. They were even kind enough to let us do our laundry at the house – yea!! The last picture is of the B & B. We got going early in hopes we would not have to deal with morning rush hour traffic in Cleveland. Unfortunately we still had to although it was not too bad because we were heading out of the city. Things were going fine until a woman driver who cut off the city bus the block before decided to cut us off at the next block. Luckily I saw her coming and let Peter know and we were able to stop in plenty of time. I was not happy with her and either was the other motor vehicle driver behind us – he beeped at her and gave her the evil eye!! I think she just was not thinking and paying attention to what was going on around her. After getting out of the city we had several suburbs to go through – much of the navigating today was tough because there were lots of turns and short times on many roads. We also got lost in the City of Painesville – it truly was a Pain!! Although a nice man on a bicycle helped us find Main Street and a good restaurant to stop for lunch. After lunch we had about 50 miles to go including going through Geneva-on-the-Lake which happens to be where the Spire Institute is located. The Spire Institute is a beautiful indoor track facility which hosts Indoor Big Tens and a few years ago we watched our older daughter Melissa compete at the facility. Our route thru the city did not take us past the facility but it did take us past the Geneva Lodge where Melissa stayed when she participated in the meet. We stopped at the Lodge to take some pictures to send to Melissa – beautiful hotel located right on Lake Erie. We headed into town- which we had not seen before. It is a nice town with lots of little shops and restaurants it was extremely busy on this beautiful summer day. It would have been nice to stop to explore but we are hopeful we will be back someday to watch Alex (our younger daughter) compete at the Big Ten Indoor Track Meet. We made it to Conneaut where we stayed at a family owned campground about 3 miles off route. 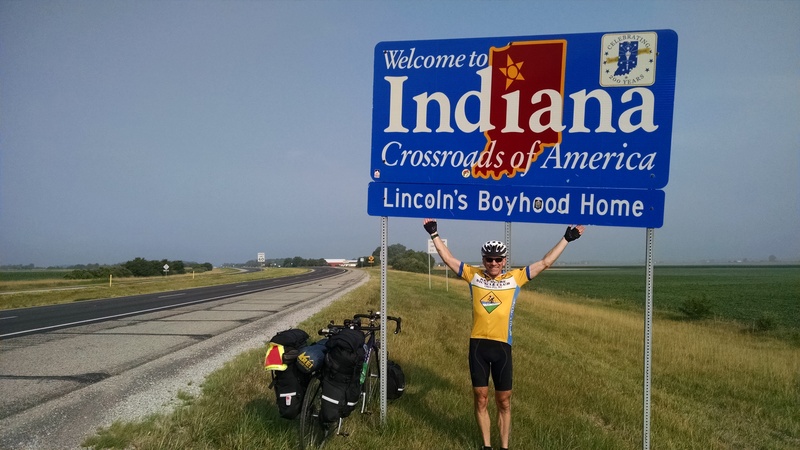 It was a nice place and I think all the campers knew we were bicycling across the country by the end of the night – boy news travels fast. The other campers were very interested in our trip and we spent a fair amount of time up at the campground office talking with them. Today was an exciting one for Tracy because she was going to be traveling into two states she had never been in before. Also for the first time we were going to be traveling through three states in one day – very fun!! 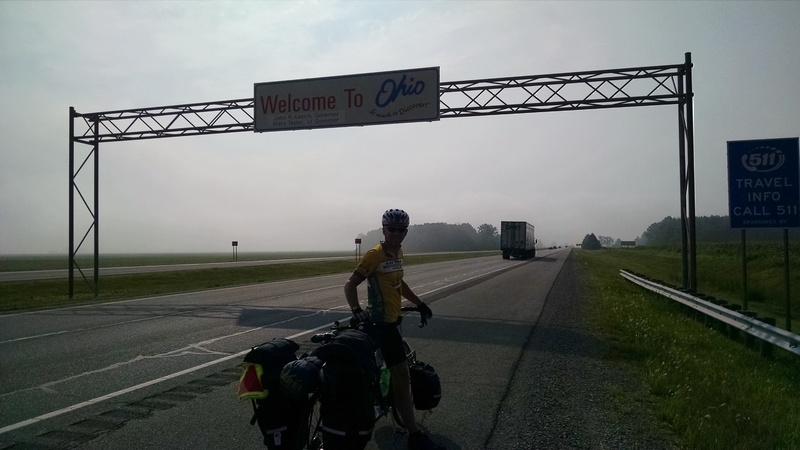 We started out in Ohio – ok it was only about 5 miles from Pennsylvania – but we still started in Ohio. Upon entering Pennsylvania we began traveling on Hwy 5 – adjacent to Lake Erie. We had great views of the lake. The largest city in Pennsylvania we traveled thru was Erie – we spent a fair amount of time in Erie mainly because Tracy got us lost. Again tough navigating with lots of turns and trails to find – yikes. We finally fought our way out of Erie and decide it was too bad we got so lost because it would have been a nice city to get to know better. 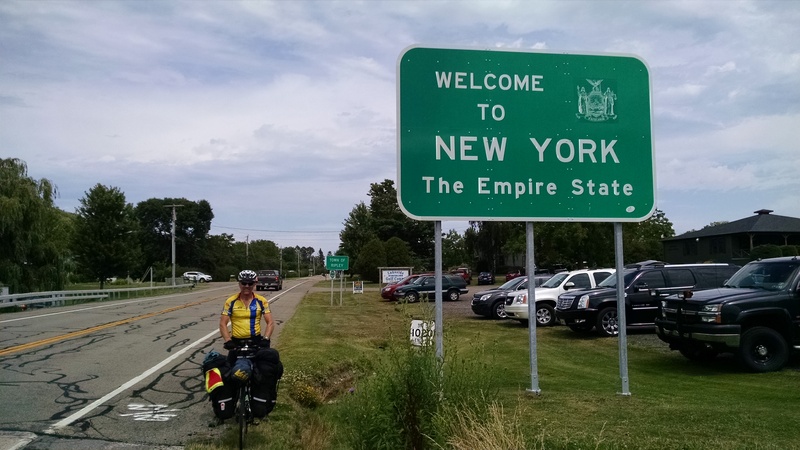 About 20 miles from Erie we entered New York(state number three for the day). We have hit wine country and are bicycling thru the vineyards and the wineries. There are not many other services in the area so we stopped at one of the wineries to see if they were selling anything to eat in their shop. All they had for sale for food was wine crackers. So we decide to sit out on the picnic table and eat peanut butter and honey sandwiches – did we ever get the looks from the people coming out of the winery – oh well we had to eat somewhere and something. 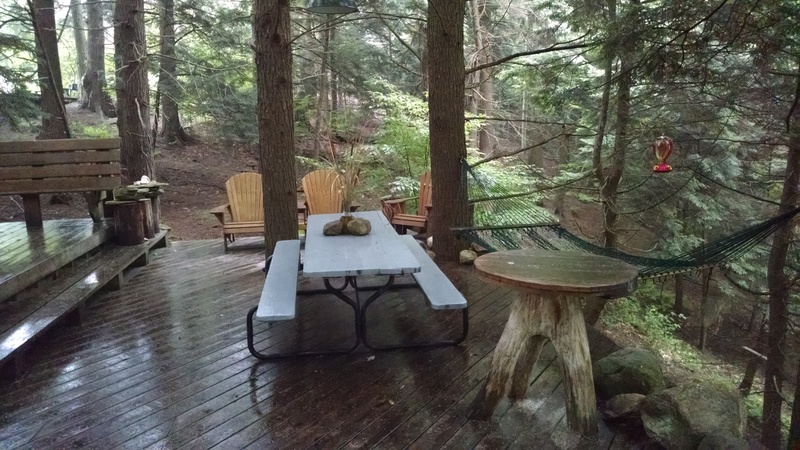 The evening accommodations were thru the Warm Showers program and we stayed with a young man – Geoffrey in Fredonia, NY. He was a great host – we got a nice shower, laundry done, dinner and got to spend the night in his tree house. 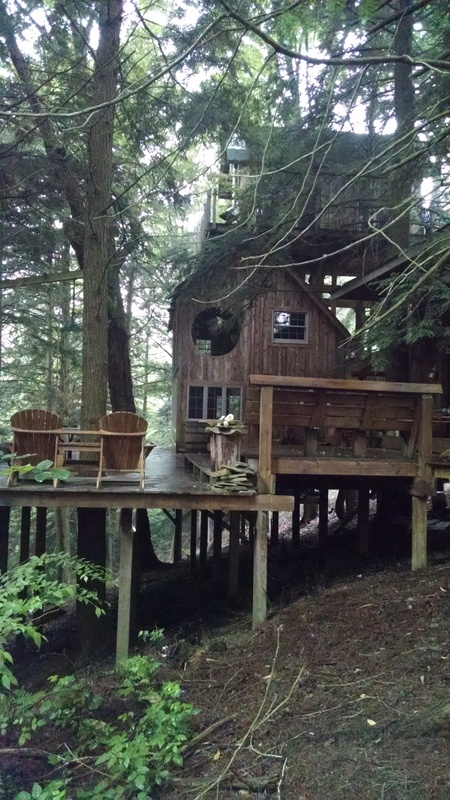 Yes – this was a first for us and the tree house was simply amazing. We got the grand tour of the facility and grounds, good conversation and a good nights sleep in a truly unique place. See the attached pictures. Today we got a late start because we were at the tree house and everyone slept in until 8:00am, we then headed back to our hosts parents house for breakfast and to get everything packed up to hit the road again. We finally left about 10:30am after thanking our Warm Showers host for such a great stay. We got back on Hwy 5 heading towards Buffalo. Due to the late start we were not sure if we would make it all the way to Buffalo and were going to decide how far we were going to go as the day went on. The ride was along Lake Erie and through the wine country. Lots of vineyards and views of Lake Erie during the day. Although late in the ride the roads really got bad – lots of pot holes and just really bad pavement right where we needed to ride. Also the road was narrow and there were a fair amount of traffic. It made for a long 30 miles towards the end of our ride. 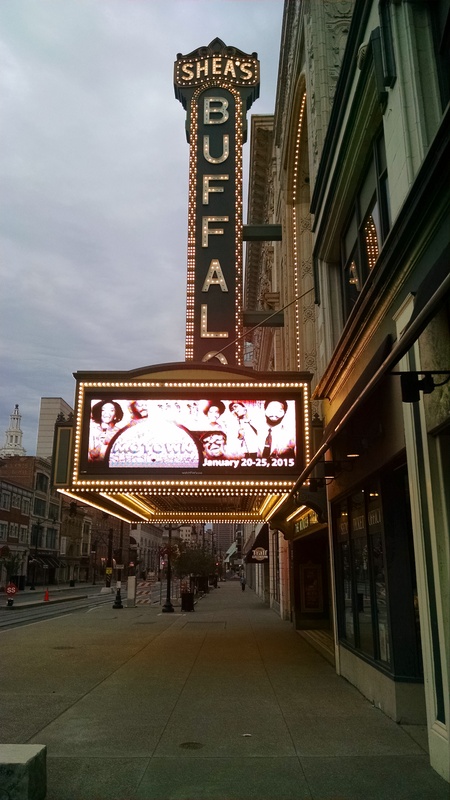 We decided to continue into Buffalo and enjoyed a great ride into the city on quiet streets due to the fact that it was Sunday night – Buffalo is a cool city and we are staying right in the city at the Hyatt. Their rates were really low and we could not figure out why until we got into city and near the hotel. The city is in the process of extending the light rail right past the hotel and everything is ripped up. So we are staying at a great hotel at a very reasonable price. After dinner we wandered around downtown and checked out the historic buildings in the area – it is a very nice downtown area now and the light rail will do nothing but enhance it even more. Today was a day off the bike and we just hung out and explored Bowling Green. We had a nice day off and actually got a nap in yea!! We got up and going fairly early because we knew it was going to be a hot day and we had quite a few miles to travel. Getting out of Bowling Green was uneventful and we were only a few miles off route. Bowling Green was a nice city and we took the time to check out campus right across the street from the hotel we were at – very pretty campus. Today’s route took us along many country roads, very quiet and with few vehicles, although it was nice the cities along the route were well spaced and had enough population that we could typically find what we needed. One thing we have found odd in Ohio is the fact that their gas station/convenience stores do not have public restroom facilities – a couple of times we have stopped and were told to go down the street to Subway and use their bathrooms – thank goodness for Subway – when you got to go you got to go!! About 45 miles into our ride we came into the town of Clyde and asked a couple in town for a good place to eat – they sent us to the local coffee shop for a nice lunch with a bit of Clyde history included. There is a very nice trail – North Coast Inland Trail from Fremont to Clyde which we entered town on. Evidently there is a gentleman in town who normally hangs out by the trail and buys cross country cyclist lunch or breakfast at the local coffee shop in exchange for stories about their trip. Unfortunately he was not in town when we came thru it would have been a pleasure to meet him and free lunch is always nice!!! The trail is a 8.5 mile long 10 Ft wide blacktop and very well maintained. The trail used to end in Clyde but they recently extended it approximately 4 miles out of town. The gentleman in town said take the trail and you will end up at the same end point as your directions on South Ridge Street – the trail ends at South Ridge and also our map addendum said the same thing. But not so right!! We got to the end of the trail and were probably two miles beyond where we should have been – so out came the GPS to try to get us back on track. After a couple of false starts we finally were back on route and not so lost. 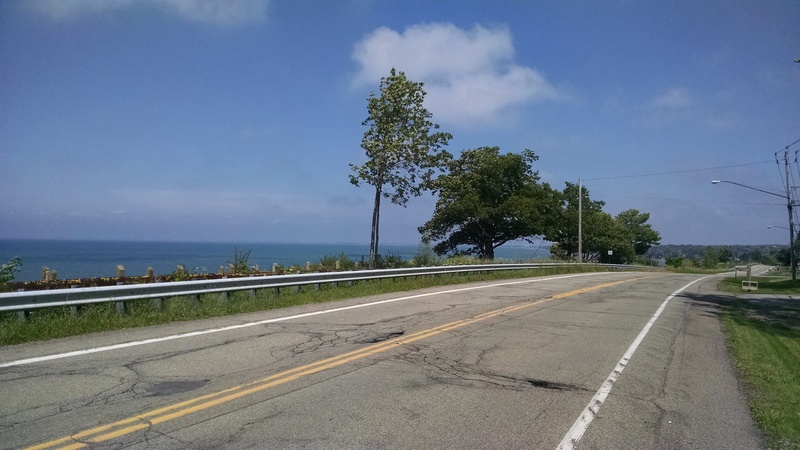 We finally got to Huron which is a city right on Lake Erie – and began our ride on Hwy 6 right along Lake Erie – our views of the lake were amazing. The day was so clear you could see forever. 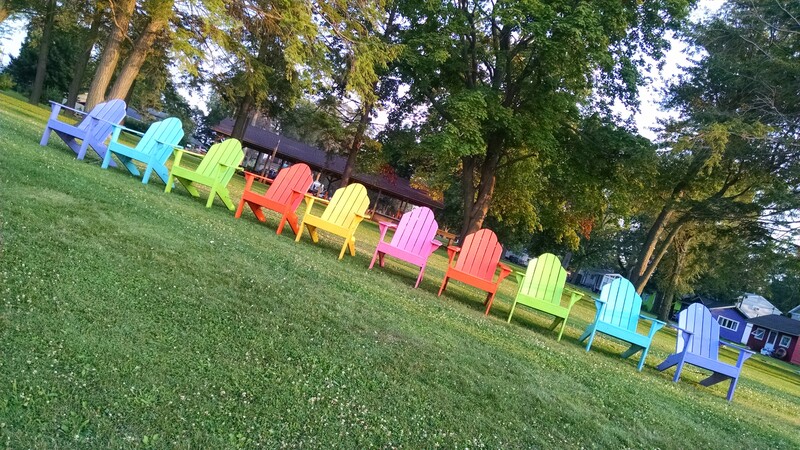 Our overnight was at the Firefly Resort and Campground which was located adjacent to Lake Erie with a great beach. So after our long hot ride into our swim suits we got for a very refreshing swim in the lake. The water was not too cold and truly felt great. After the swim we relaxed in the Adirondack chairs for a while and then got our tent set up and made dinner. We ended the night at the campground bar – for some air conditioning, visiting and a couple of cold beers. Our night of sleep was interrupted by a storm and a faulty radio that our campground neighbor had. At about 2:00am Tracy heard a loud radio go off and continue to play for several hours – then the storm came through at 4:00am and the radio continued to play but was pretty much static because of the storm. Peter finally walked over to the next site to see if he could turn the radio off but unfortunately the radio was inside the camper with only the speakers outside. He finally knocked on their door out of desperation – no one answered. Although a bit later someone came out and realized what the problem was and turned off the radio. The man apologized the next morning and told us how sorry he was and the radio was old and he did not even realize it was playing – you could tell he felt really bad. So we started our day with not much sleep and wet!! Oh well off we go. The day was gloomy and it rained very lightly the whole ride. It was kind of like being in the car wash when you are going thru the spot free rinse – light by steady rain!!! The ride to Cleveland was very nice we were on Hwy 6 and Lake Road most of the way. Lake Road is a beautiful street with amazing big house located on the lake side of the road – it was about 25 miles of big beautiful homes unreal. (It reminded us of Whitefish Bay and Shorewood’s Lake Drive – near Milwaukee WI for those of you familiar with the area – by 5 – 6 times longer) Too bad the weather was so miserable and gloomy because I think we missed a whole bunch of great views – oh well we will just have to come back someday. We got in to Cleveland thru Edgewater Park – a urban park that has paths that drop you right into the city. The bicycle facilities and routes are clearly marked and easy to follow into Cleveland. They have really done a nice job with their bicycle and pedestrian facilities. 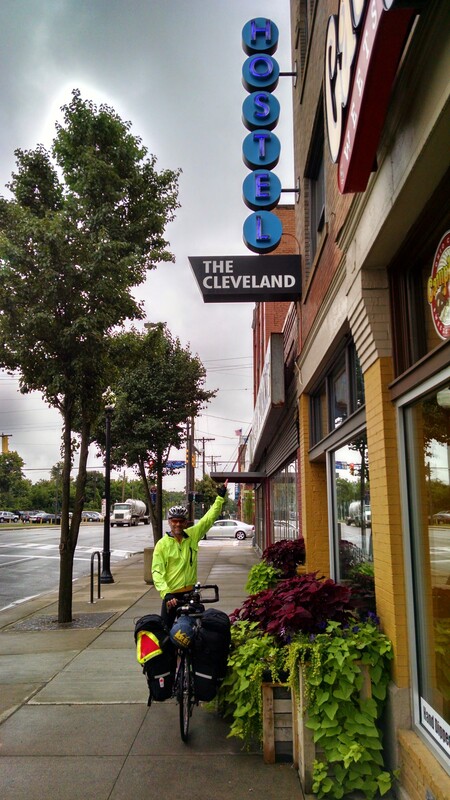 We were staying at the Cleveland Hostel located in the center of a revitalized area in the city. 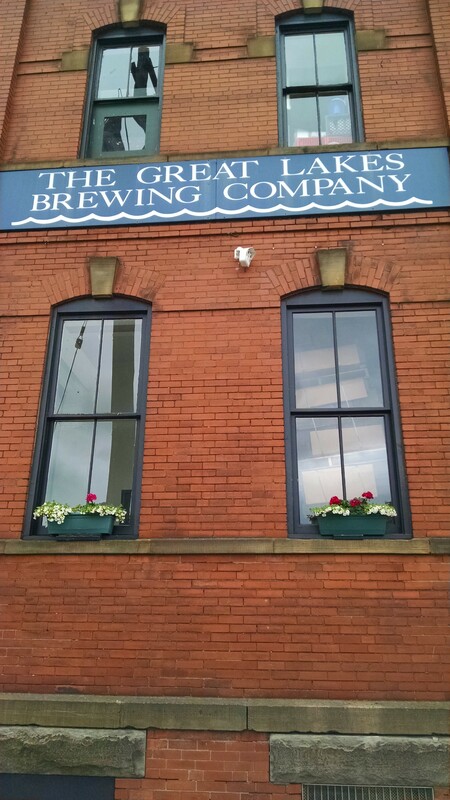 It is very nice and Peter’s favorite part located within walking distance of four micro breweries – I think we will be shipping glasses home again!! 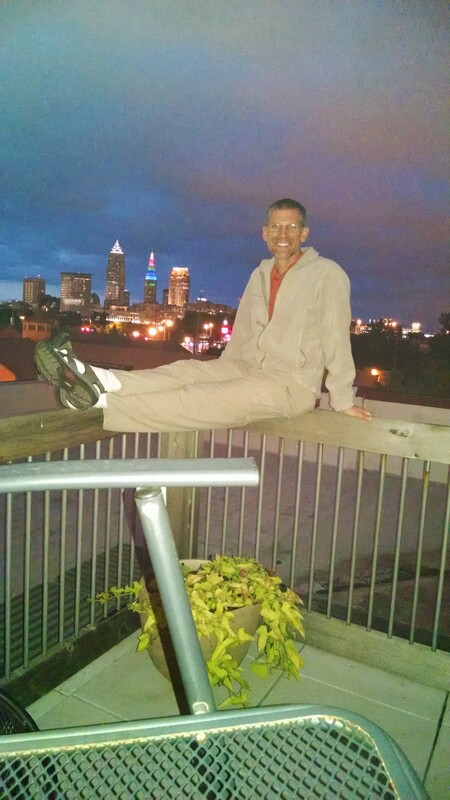 The Hostel has a roof top patio which we took advantage of and got some great views and pictures of the Cleveland skyline – see the attached photos. Today was our day off and we spent most of the day getting reorganized to take off tomorrow. The most important task for the day was to find a bicycle shop that could fix our broken back wheel spoke. We had struck out in the city due to the fact that our tandem rear wheel had a drum brake on it and a special tool or innovative procedure was required to get the drum brake off to be able to fix the spoke. We also had a lunch date to keep with a family friend – Emma Hawley – who went to school with our youngest daughter. She was attending summer school at Case Western University – located on the east side of Cleveland in the University Circle area – about 6 miles from where we were. So we hoped on the bike to head out to lunch with Emma. 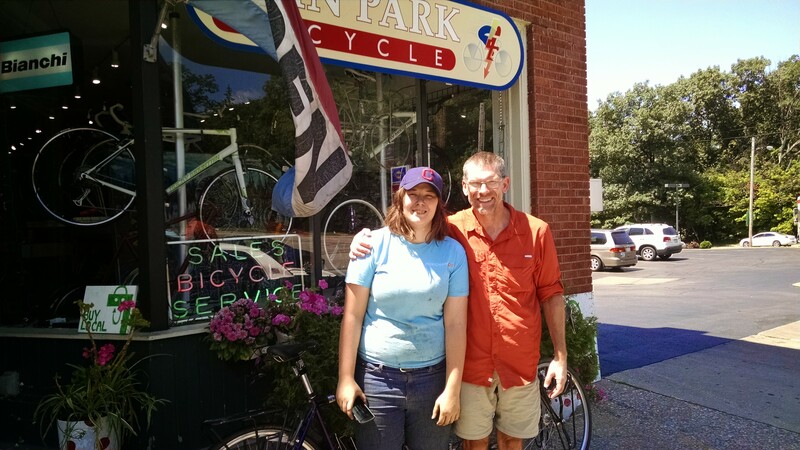 We got there a bit early and a young man was talking to us about our bicycle and trip – Peter explained the problem with the wheel and he suggested we take the bike to Cain Park Bicycle Shop which was down the road about three miles. Peter gave the shop a call and Madeline (one of their mechanics said bring it in I have worked on Santana Tandems before and should be able to takes care of it for you) After lunch we headed to the bicycle shop and Madeline was able to fix it she used a trick to get the drum break off and proceeded to fix the spoke – yea!! We were back in business. Thanks Maddie and Cain Park Bicycle Shop. It was fun to watch Maddie and her coworker, as we waited for the bike repair, interact with their customers – they were very gracious to them all and clear on what needed to be done to fix their bike and what it would cost – the shop was extremely busy and each customer was acknowledged and helped in a timely manner. Very professional. 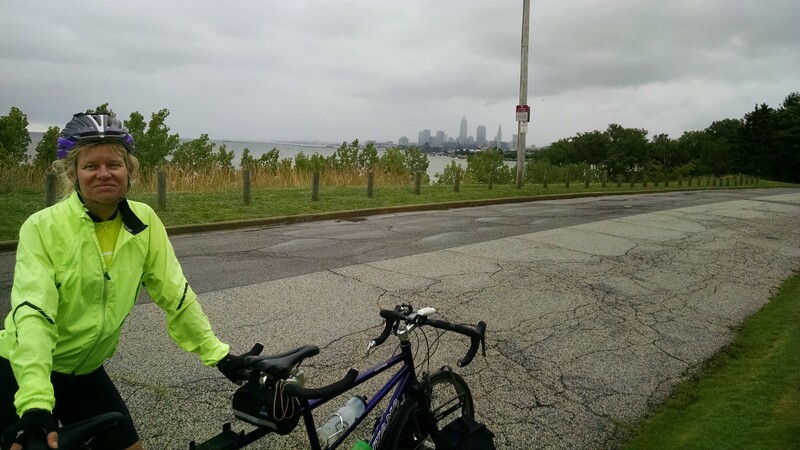 Being able to bicycle to lunch with Emma and to our bicycle repair allowed us to see more of Cleveland – the road we traveled on to go thru the city had a bicycle lane the whole way – approximately 10 miles. It was fun to see different areas of the city and to so easily travel thru by bicycle. Way to go City of Cleveland and Bike Cleveland. We got up and had breakfast at the hotel and then headed out by 8:00am for our long day on the bike. We decided to go the 92 miles to Shipshewana because there was not many or any other places to stay along the route. We needed to get back on route from Hastings and headed 4 miles down County Road 179 to get back on route. The route today was very nice with the roads traveling adjacent to several lakes and natural areas. One area on the map near Yorkville looked like it would be beautiful because it appeared the road was adjacent to Gull Lake, but Tracy was disappointed because you could not even see the lake past all the huge house located adjacent to the lake. Tracy was wondering if there was even public access to the lake – it would be a shame if there was not. 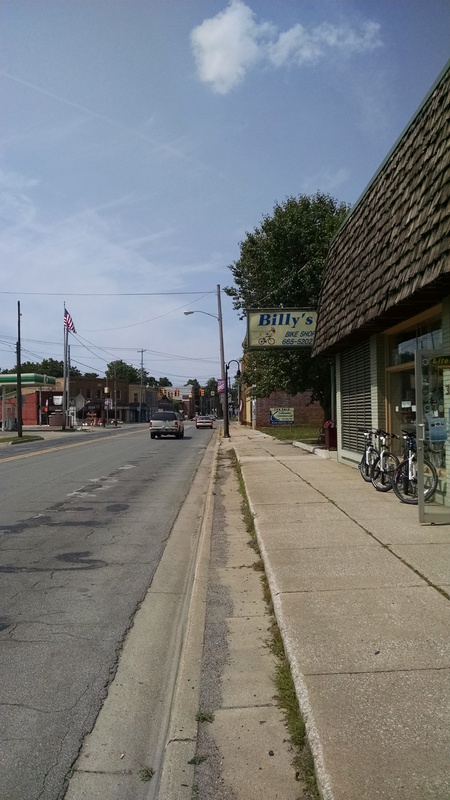 We then traveled down to Galesburg for lunch at a nice local restaurant and a stop at the local Bicycle Shop – Billy’s Bicycle Shop – (yes that really is the name) The owner an older gentleman has owned the shop forever and had lots of wonderful stories about professional and amateur cyclists he had worked with. He loaned us his floor pump so we were able to top off our tires. We also have been having trouble with our bicycle computer (it has been working on and off) and need to purchase a new one, unfortunately he did not have any in his shop – oh well we will just have to make due with what we have. The next town along the route was the town of Scotts in Michigan and the last town in Michigan – Centerville. Down the road 18 miles later we entered Indiana – yea another state. We were only about five miles into Indiana at the end of the day. We were planning to stay at Shipshewana Campground and Amish Log Cabins in Shipshewana, IN. Tracy decide to stay in the cabin when the campground manager told her for $30.00 more we could get a Amish Camp Cabin with beds for four, heat, air conditioning and lights – again it was easy to makes the choice to the cabin. The cabin was beautiful and built by the local Amish, we were the only ones in the camp cabins and had the restrooms and showers all to ourselves. Today we got going a little later than usual due to the fact that Tracy was so comfortable in the cabin and did not want to get out of bed. We had breakfast and took off to experience Indiana. The weather was beautiful and so was the ride. We were bicycling thru Northern Indiana and what was predominately Amish country, we thoroughly enjoyed bicycling thru the area with almost all non motorized vehicles, it was us, other bicyclists mainly Amish and many Amish buggies. We have never seen so many buggies going down the road – I think due to the fact that it was Saturday many Amish families were headed to town or visiting. It was interesting traveling down roads with very few or no cars – it was much quieter and calmer due to the lack of motor vehicles – Peter and I liked it!! The Amish people were very friendly and were always ready with a wave or a hello. I think our tandem bicycle was intriguing to them and as we bicycled past their homes, buggies or bicycles there was frequent waves and hellos. This area of Indiana is truly beautiful and the Amish farms definitely add to the beauty with their simple life and well maintained homes, gardens and yards. All to soon we were out of Amish country and wished we would have spent more time and went in to some of the towns in the area. Shipshewana had a lot of cool shops and restaurants which would have been fun to check out. We did stop in LaGrange (a town located on the edge of the Amish area) for lunch. There were some buggies and Amish people in town but I am sure nothing like you see in Shipshewana. We will have to come back someday to further explore the area. After lunch we finished the last 60 miles to Monroeville. The ride was a tough one with lots of little hills that tend to wear out your legs. By the time we got in we were definitely ready to be done. 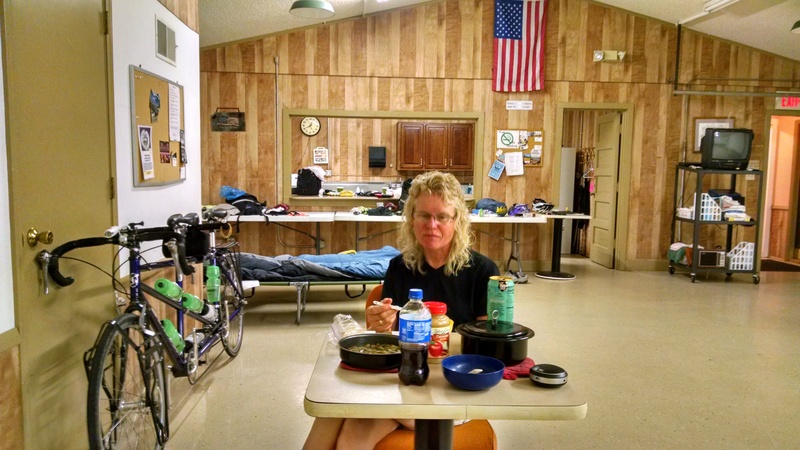 Plans for lodging for the night were to stay in the Monroeville Community Center but we were not sure if we had a place to stay or not – Tracy left two messages for the contact for the facility and we did not get a call back. We figured we would figure it out when we got there. We should not have worried – when we pulled into the City Park an older gentle man was walking down the sidewalk and waved and said welcome to Monroeville Tracy and Peter. Warren is the volunteer who takes care of the facility and welcomes and gets the bicycles settled in. He took us into the community center and went thru everything with us – in the building there was a full kitchen, private bathroom with shower, washer and dryer, cots for sleeping and an entertainment cart with a TV, games, videos etc. The facility was free for Cross Country Cyclists to use. To say the least it was great – we were the only guests that evening so we had the whole place to ourselves – nice!! On a side note – Warren and Monroeville, IN received an award from Adventure Cycling for their unbelievable hospitality a few years ago. The award is truly deserved and they continue to welcome cyclists into their community and provide them with everything they need at no cost – we were very lucky to be able to take advantage of their hospitality. 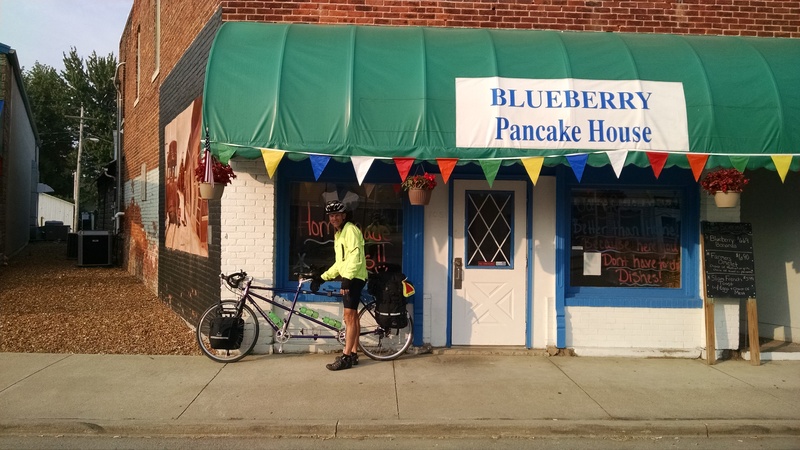 We started our day at the Community Center in Monroeville, after cleaning up and signing in the guest book we headed to the Blueberry Pancake House for breakfast. 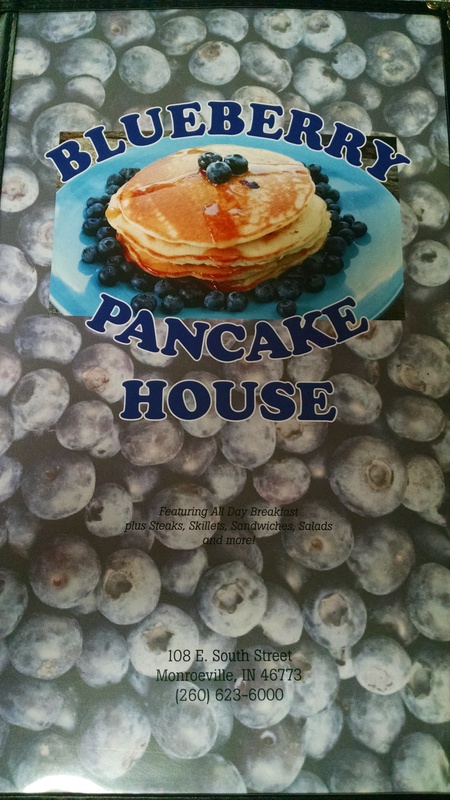 Yes the blueberry pancakes were to die for -yum!! Great way to start the day. We biked into the fog – pretty thick for awhile – thank goodness Jeff from JB Cycle had given us a set of lights to attach to the bike when we were in Green Bay – we had them on so anyone within a mile radius could see us!! – Thanks Jeff(and Matt too). Five miles down the road we entered Ohio and the first Ohio city – Payne. The majority of our ride today will be on the Ohio Byway which is located adjacent to several different rivers – including the Maumee River. 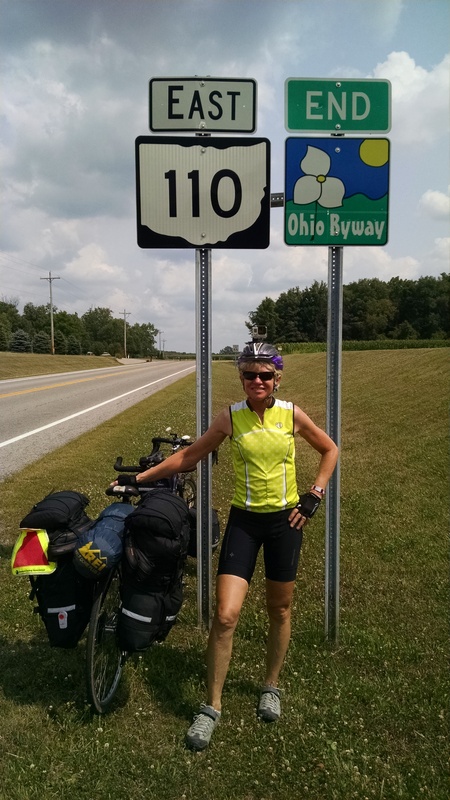 The byway is a great ride, low traffic volume, flat, beautiful views and evenly spaced towns to visit. We even encountered our first Towpath along our route. It was an alternate which we did not take – directions on map – “Walk your bike on this unimproved towpath trail for 2.5 miles” To push a fully loaded tandem for 2.5 miles is just not going to happen. In Napoleon we stopped for lunch at Subway – first time on this trip – we have not been near many it was nice to have the option especially since Peter had been craving a Subway Sub. The young ladies working the counter were very excited about our trip and asked lots of questions. We gave them our card with the blog and face book on it and they immediately pulled the site up and were looking at the posts -we were the only customers in the place. Just before Bowling Green we met up with a cross country cyclist who was going east to west. His name was Julio and he was from Columbia South America. He had started in New York and was headed to San Francisco. He was stopped at a gas station having a snack. He was a bit down because his knee had been hurting him all day and he was worried about it. Before we took off our separate directions he said he was feeling better and not so down and thanked us for cheering him up. We hope his knees holds up and he completes and enjoys his trip. Too funny earlier in the day we saw another cross country cyclist going west and stopped to chat – he said “keep going” in his very British accent and waved us along. We just laughed and decided he was either sick of the American’s who always wanted to talk or in witness protection and did not want us to get a good look at him. From Napoleon we headed the last 30 miles to Bowling Green – when we arrived in town we decided to get a coffee at Starbucks. We must have stood outside for a half hour talking with people about our trip. The first young man was a musician from Nashville- he was very intrigued with our trip and we talked with him for a long time. He had just been in Travis City, MI playing at a wedding and was heading home. Nice young man and obviously very talented. Then we had a father and his two boys (16 and 17 year olds) who were on a motorcycle trip – the youngest boy was driving a car with all their supplies and dad and the older boy were riding the motorcycles. They were from Detroit and were heading back home after a three day trip. They were having a great time and seemed like they were truly enjoying their time together. They had lots of questions and were fun to talk with. Finally a young couple from Ohio (marathoners) came up and talked about the trip and were asking us to compare it to running a marathon – work load etc. They are getting married in six weeks. Maybe the musician from Nashville can play for their wedding!!! But we really needed to choose a hotel get a much needed shower and eat dinner. Tomorrow is our day off – we will relax and restock, do laundry, clean and repair the bike etc. One more Act of Kindness to relate – we are at the laundry mat in Bowling Green and the attendant came up to Tracy and asked if we were hiking or biking. She then said I see your small laundry soap bottle is empty can I fill that back up for you and is there anything else you need. Very simple for her but huge for us – we were planning to purchase more laundry soap later today. More to come in a couple of days – our next big city will be Cleveland – we may be doing a presentation for the local advocacy group – Bike Cleveland. Peter is working on setting it up with Jacob from Bike Cleveland, Jacob was Peter’s contact when he taught a law enforcement class in the spring – hopefully it will all work out. Today we got up to a cold day at our campsite (at Rampart Memorial Park a city run park)- luckily our tent was under an open pavilion so we were able to at least not have a totally soaked tent as well. We had our typical camp breakfast(oatmeal,coffee and tea) and then headed off on the bike with tights and a jacket on to keep us warm. We were actually off route about 4 miles and were looking at the map to figure out the best way to get back on route when a gentleman who maintained the flowers at the park came over to say hello. Of course he lived in the area all his life and was able to give us directions to get back on route, he was even able to give us street names and not just turn by the big Oak tree on Mr. Smith’s farm!! 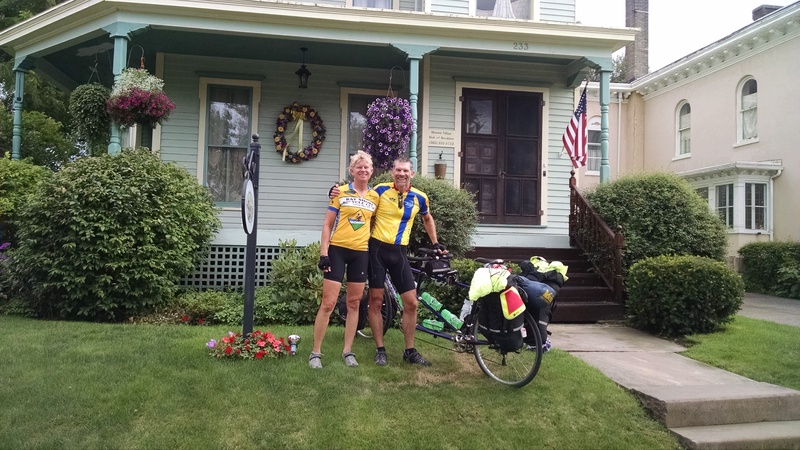 The route for the day was through some very beautiful areas of Michigan but definitely not direct – it appears Adventure Cycling Association has decided to run us a bit in circles in Michigan – this could be due to the lack of paved roads but it still seems extreme to us. Also we are traveling in areas that have little or no services which makes it hard to find supplies and somewhere to stay. Oh well we will continue to make do. We stopped for a snack in Hardy Dam and were sitting out on the bench by the convenience store taking a break when two gentlemen came up to ask about our trip and where we were going for the night – They were sales men for Artic Ice. We told them our story and said we were looking for a place to spend the night and were planning on staying at the Lincoln Pine Resort and were trying to figure out exactly where it was located – they were familiar with it said it was very nice and gave us directions. Off they went but remember them!!! Due to the fact that services are limited we were not able to find a restaurant until about 2:30pm – too late in the day – we were hungry and Tracy was a bit bonked because she had not had a good lunch to keep her going – we have found we can only go so far without a good meal – the snacks, power bars, Gatorade etc. just don’t do it. So we finally got to the City of Coral which was suppose to have a restaurant. We got into town and the local restaurant was busy with the staff cooking and getting the baking done for tomorrow’s business day but were not open. Tracy stuck her head in anyway to double check and they said indeed they were closed. So we were standing out side to decide if we wanted bar food or convenience store food when the restaurant owner walked over and said she would be happy to feed us even though she is closed. We said great and headed back to her restaurant for a delicious wrap and some fresh baked cookies – YUM!! The Coral Bakery and Bread Company had opened 6 weeks earlier and the owner Jacquie Fase already has quite the business and we are hopeful she will be successful. 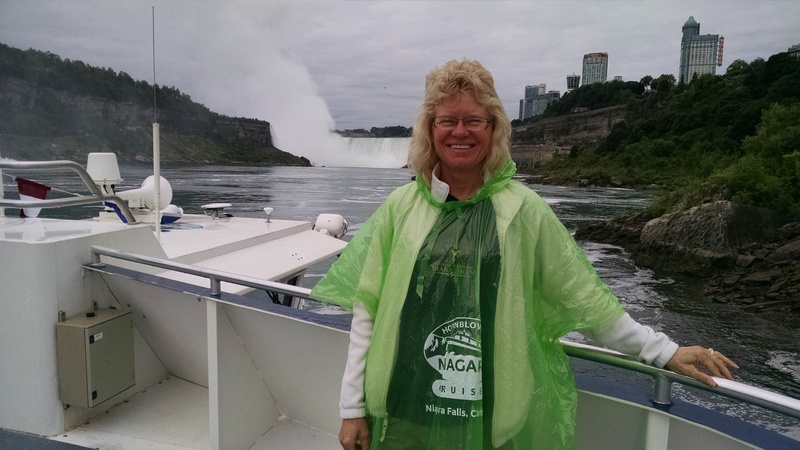 It is her and her husbands retirement jobs – she is currently the transportation coordinator for the local school district and has handled a very stressful job for 20 some years and plans to retire next year. She is very much looking forward to retiring from the school district for a lot of the same reasons municipal employees are leaving the public sector – the jobs have just gotten tough. Act of Kindness #1. We then hopped back on the bike for the last twenty miles to the campground. We got to the Lincoln Pines Resort at about 5:00pm and stopped at the office to check in. The young lady in the office greeted us with you must be the bicyclists who are biking across the country – we were like yes and how do you know – she said the two salesmen from Artic Ice stopped in and told me to expect you. She then proceed to give us a campsite at no cost. We are sure the salesmen either paid for it or just suggested it and she decided to do it on her own. Act of Kindness #2. The campground was beautiful and well kept, we enjoyed our visit. We got up at about 7:30am this morning, had breakfast and took off. Stopped at the park office to once again thank the park attendant. We were not sure where we were going to end today because there was not much for services on the route – we planned to get started on route and then later in the morning make our decision on where to end. Our first township was Harvard, then to Grattan – both were pretty small with little or no services. We continued on to Smyrna which also had no services so on to Saranac where they had a nice restaurant – YEA!! While eating lunch we struck up a conversation with the gentlemen at the adjacent table when they came in and the waitress yelled across the bar do you want the usual – Tracy leaned over and proceed to tease them about being regulars!! They were very helpful to us in deciding where to end our trip for the day. With their help and expertise we decided on Hastings, MI – good idea. Peter was not feeling so good and did not have a lot of power in his legs so a shorter day and a hotel for the night was definitely the way to go!! The end of our ride was on the “Nash” Highway which made both of us smile because it reminded us of our former neighbors Mike and Becky Nash – we really miss them!! 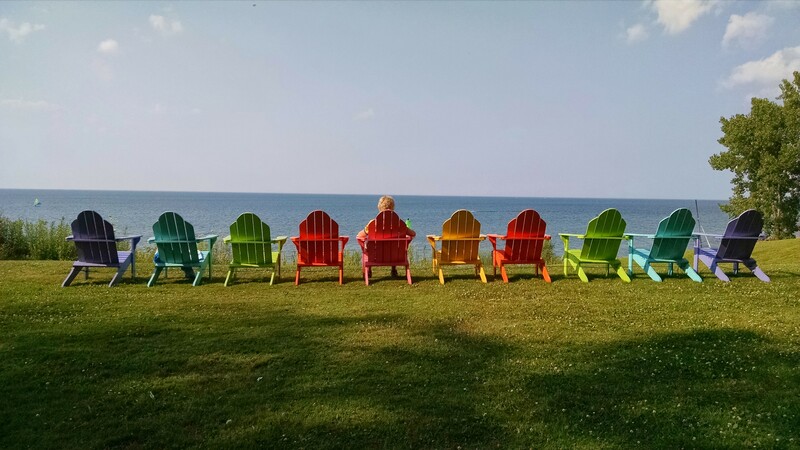 Although we are sure they are enjoying their new life in Door County. We had a nice dinner, got our laundry done and are enjoying watching the Tour de France (we have only been able to watch it two times – bummer). We got home on Thursday about 5:00pm and stayed in Green Bay thru the morning of July 14. It was nice to be home and sleep in our own bed. We had a chance to visit with friends, do our laundry, some tasks around the house, bicycle repairs, restocking for the rest of the trip, purchasing some new bike shorts and gloves (ours were trashed after 2600 miles) and relaxing. Although we enjoyed being home we were both ready to get back on the road again come Monday morning. We had an Open House on Friday at our home and several friends stopped in to visit and hear all about our adventures – it was great to see everyone. Thanks for stopping over. We are excited to take the Badger Ferry across to Ludington and to see and visit with Tracy’s parents. It should be fun. We got up early to head to the ferry and were on the road by 7:00am, we were excited to be on our bike again. The ride to Manitowoc included about 20 miles on the Fox River Trail – the trail is beautifully maintained (paved north end and gravel south end). We have ridden on the trail so many times it was like being at home. Once we left the trail we traveled on county roads which rolled us thru the country side with little or no traffic. It was an easy ride because we are so familiar with the area and enjoy the route. We arrived in Manitowoc by 11:30am and met Tracy’s parent at a local restaurant- called Warrens’. Tracy’s parent grew up in Manitowoc (dad) and Two Rivers (mom) and when Tracy was young they used to eat at this restaurant – I think the place still looks the same!! The food was good and filled us up before the four hour ferry ride to Ludington. The ferry ride was fun and we had a great chance to catch up with Tracy’s parents. We arrived in Ludington and then biked the four miles to our hotel and headed to Big Boy for dinner. We all were hungry and glad to get a good filling meal. We had breakfast in the morning with Tracy’s parents and then they headed north and we headed east and south. 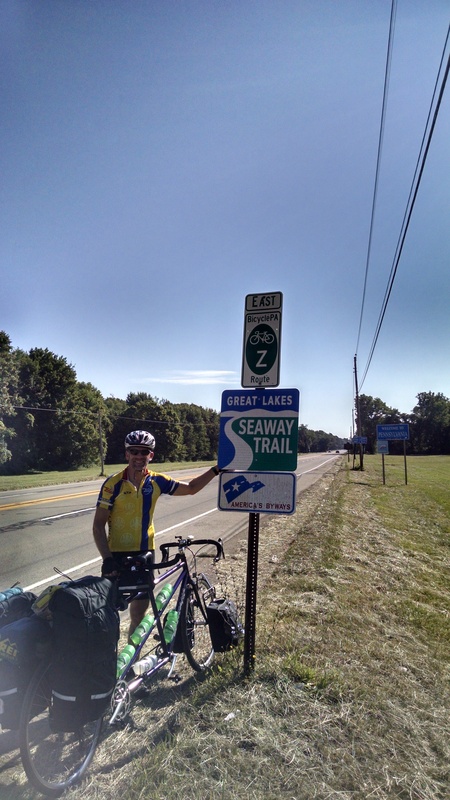 Although the route took us north to go south due to the number of unpaved roads in Michigan. Michigan is not at all like Wisconsin – when it comes to paved roads – in Wisconsin almost all roads are paved due to our Farm to Market needs in Michigan not so much. So after heading north for the first 15 miles we finally started heading east and south – yea!! The NW wind even helped push us along when we started to travel towards Indiana- our next state. Much of the beginning part of the route was familiar because we biked across Michigan (east) a couple of years ago and took the same Adventure Cycling Route. Once again we stopped in Freesoil a small town north and east of Ludington. We stopped at the same gas station that we had stopped at a couple of years before. While there in the past we met two older gentlemen and sat and talked for quite a while, they were very interesting men. While we were visiting with the attendant today Tracy noticed a sign that said Old Farts Club and asked the attendant about it – she said that two older locals met there each morning and a friend of theirs made them the sign as a joke. I asked if they were the same gentlemen we had met and it sounds like they are. We asked her to say hello to them for us (who knows if they will remember us – but we sure remembered them) and continued on our way. Our route then took us south and east through some very quiet roads with lots of woodland and grass areas. There is not much farming in the area – not sure why but the land seems to be used for grazing, grassland and woodlands. 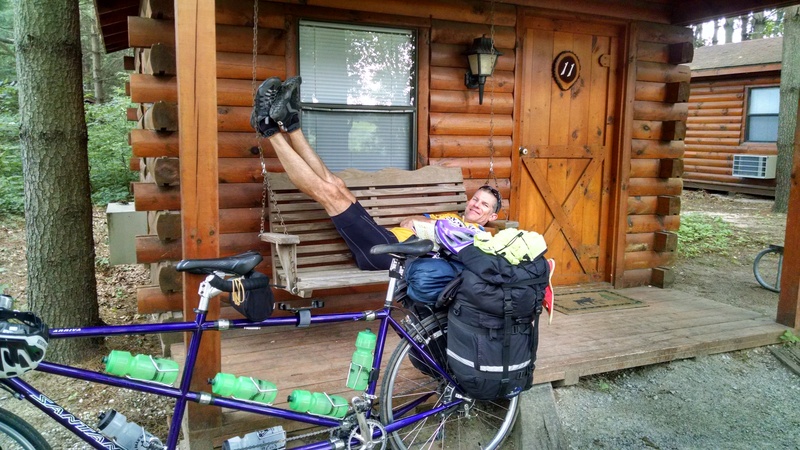 We decided to go off route about 4 miles to Reed City to stay at their municipal campground –it sounded nice and had showers!! 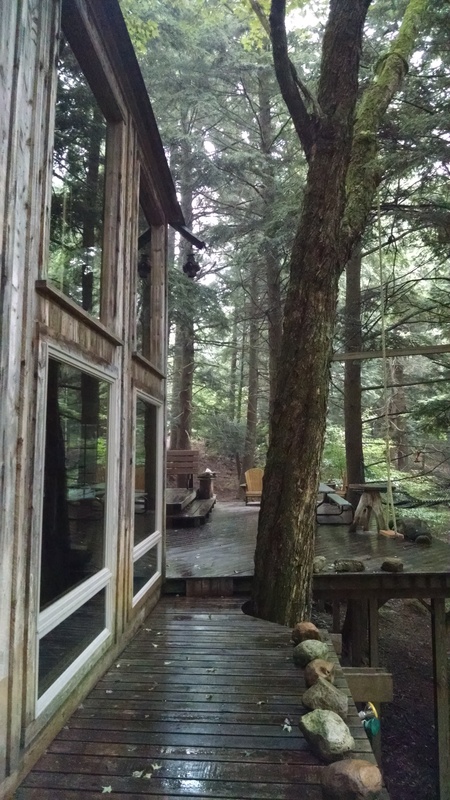 We got into the campground and under the open pavilion just as the sky opened up. We ate dinner and waited for the campground host to return so we could pay our fee and get the key to the showers. She finally arrived about 8:00pm so we were able to get a nice hot shower before going to bed. We got up early and then enjoyed breakfast in our cabin. It was nice to have a space to cook and a table to eat at in the cabin. It was nice to be back in Wisconsin and with all the great county roads to bicycle on. I don’t think we had a car pass us for hours at a time. Also the area is so beautiful, lots of farms and rolling hills. The ride was good but a bit tough – the route we took did not have any towns to stop in to grab something to eat or drink and we both bonked due to not eating enough – we truly should know better but we just kept going on Cliff Bars and Power Bars- not quite enough. Add to that the fact that we were dealing with a tough headwind for the last 30 miles of the ride and we definitely needed lunch when we reached Plover. Luckily there was a Chinese Buffet we hit – lots of food to fill us up. We then went over to the O’SO Brewery in Plover and had a couple of beers – good beer and fun brewery and of course Peter had to buy another beer glass!! We then headed to Amherst for our overnight stay at a Warm Showers home. Kris and Cathey were very gracious and welcomed us into their home with a great dinner and interesting conversation. We started our day the next morning with homemade scones and fresh fruit – what a great way to start our next bicycle day. Special thanks to Kris and Cathey!! We were excited to get going this morning because we were going home for a few days. Our route took us again on several county roads and we enjoyed the beautiful scenery and quiet roads. Our route took us through Weyauwega where we stopped to visit with the City Administrator – Patrick Wetzel who is a friend of Tracy’s. It was nice to see Patrick and we had a nice visit. He has been doing a good job as the Administrator and has lots of exciting things going on or in the works. We then headed to New London on Hwy X a beautiful road located adjacent to the Wolf River. After lunch we were cruising along – I think we both were getting excited to get home. About 20 miles out a couple of reporters and camera man from Fox 11 showed up to take video of the rest of our ride to Green Bay. They were getting footage for a story they planned to do on our bike ride. They finally met us at our house and interviewed us to complete the story. It was very fun. For those of you in the area it will air Thursday night and I am sure will be on their website later – please take a look. We are happy to be home for a short break but excited to get going again and will head to Manitowoc to take the Badger Ferry across with Tracy’s mom and dad. We are excited to spend some time with Tracy’s parents to find out how their summer is going and tell them more about ours. Hope to see you tomorrow Friday, July 12th at our house anytime between 4:00 – 9:00pm BYOB and a treat to share we need the calories!! !